Webster Groves girls soccer player Audrey Swain, #22, tries to get the ball from a Rockwood Summit player during the April 9 game. Senior forward Gretchen Skoglund, #16, is Webster Groves’ leading scorer. 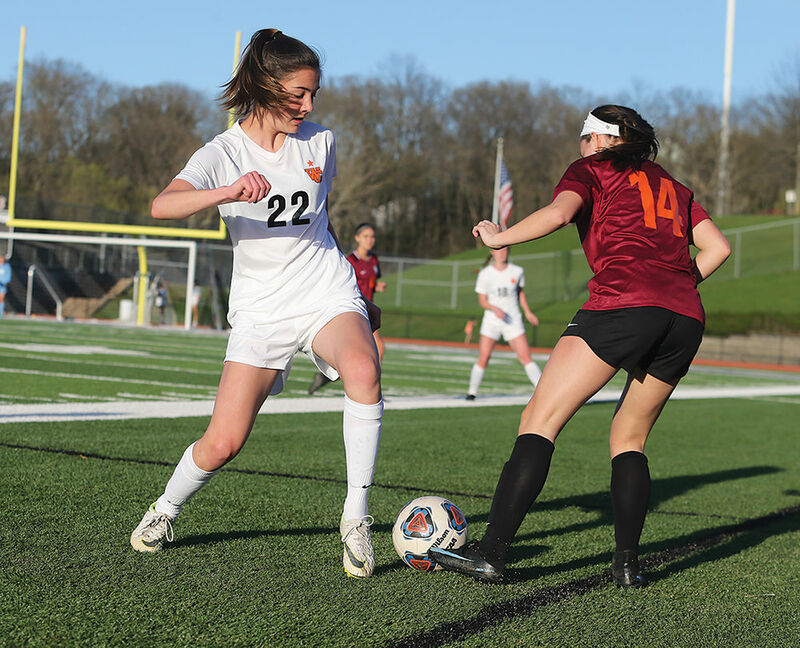 Webster Groves High School’s early 1-0 lead against host Rockwood Summit showed signs of a top high school girls soccer performance. But the Statesmen lead didn’t last as top-notch Summit rolled to a 4-1 victory on April 9 in what could be a preview of the Class 3 District 3 championship at the same venue next month. Webster Groves Coach Thom Champion said he wasn’t concerned with the loss. The Statesmen (4-3) face Parkway South at 5:45 p.m. on April 12 at Selma Field. Other key regular-season games include Kirkwood (5:30 p.m. on April 18 at Selma Field), Nerinx Hall (noon on April 20 at Nerinx Hall), Visitation (2 p.m. on May 4 at Selma Field) and Lafayette (6 p.m. on May 7 at Selma Field). 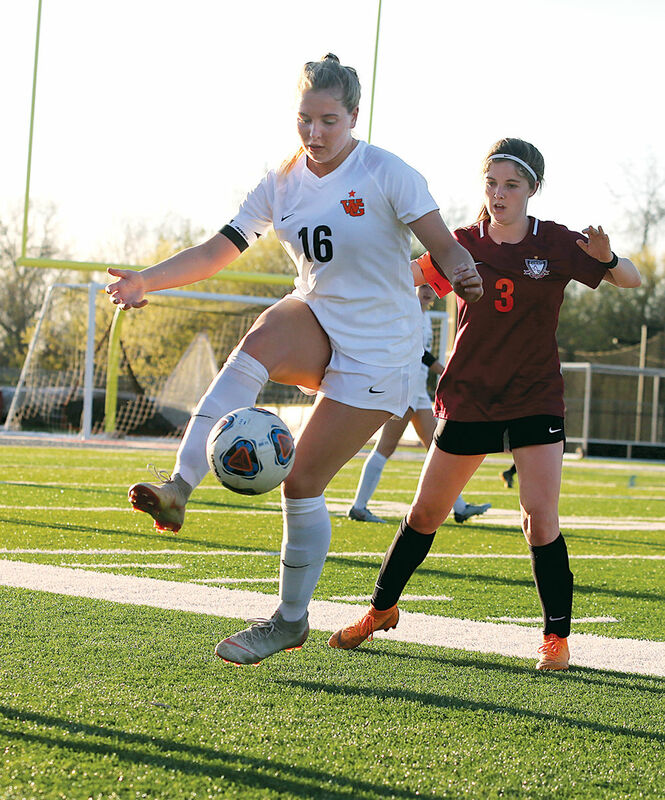 Senior forward Gretchen Skoglund, headed to play at Butler University, is Webster Groves’ leading scorer with eight goals for 16 points, both team highs. The Statesmen have scored 14 goals in seven games. Her eighth goal of the season came with 33 minutes, 52 seconds left in the first half. She tapped in a bouncing pass from forward senior Emma Atherton into the net to give Webster Groves a temporary 1-0 lead. The Statesmen played without two starters in freshman sweeper Annie Kennerly, who was in New York for a school choir event, and senior forward Zoe Castro, who suffered a concussion in a 3-0 victory over host Ladue on April 2. Champion usually starts four freshmen. The other freshmen are midfielder Ellie Paloucek, already on college coaches’ radar, defender Sophia Wilson and midfielder Audrey Swaine. Freshman forward Keegan Bluette is also on the varsity roster. Paloucek has scored two goals and has four assists for eight points. “She has a special talent,” Skoglund said. Chris Allen, former Webster Groves head girls soccer coach who now is an assistant coach for St. Louis University, attended the Summit game to view the play of Paloucek.